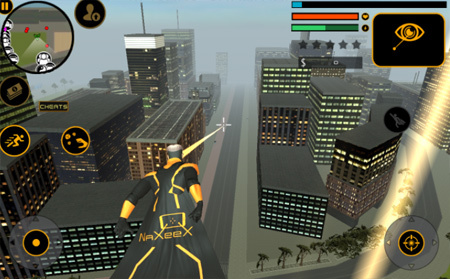 Naxeex Superhero is a unique simulation game by Naxeex LLC. This will be the ultra hero and the only hope of humanity, all the superpowers are combined in a single hero. Giant robots as a fearsome enemie forces, flight, eye lasers, entangling rope, superkick, and all the others. Stand once again on the guard of helpless citizen. Use your superpowers combined to fight off the endless waves of steel creatures. If you get stuck in the game, check out the video walkthrough and gameplay for the game. This entry was posted in Android Games, iOS Games, Mobile Games, Walkthrough and tagged Naxeex Superhero Cheats, Naxeex Superhero Gameplay, Naxeex Superhero Guide, Naxeex Superhero Hints, Naxeex Superhero Review, Naxeex Superhero Solutions, Naxeex Superhero Strategy, Naxeex Superhero Tips, Naxeex Superhero Walkthrough by Marvin. Bookmark the permalink.